MCH Arena is a purpose built football stadium located in the Danish city of Herning located in the Central Jutland Region. 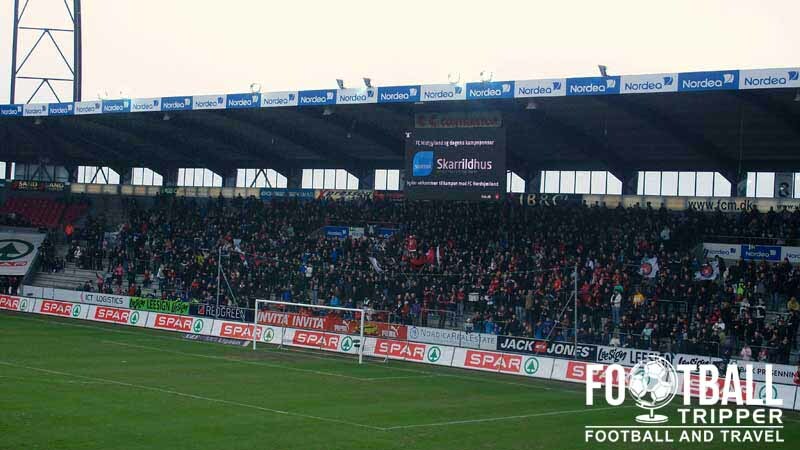 Home to local team FC Midtjylland who formed in 1999 after a merger between Herning and Ikast, the ground which was built between 2003 – 2004 has a capacity of 11,800. 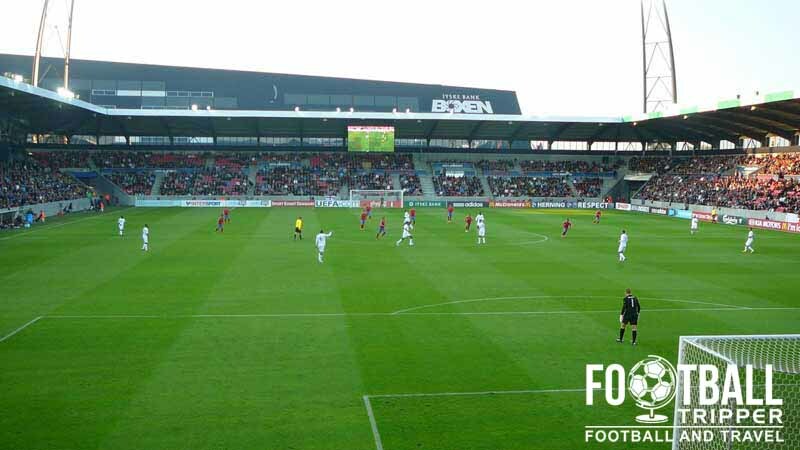 FC Midtjylland’s stadium first opened in 2004 when it was known as the Messecenter Herning Stadion, before becoming the SAS Arena for five years between 2004 – 2009 after Scandinavian Airlines opted to purchase the naming rights. Now referred to as just MCH Arena, the ground cost an estimated 85 million DKK and took less than one year to build between April 2003 – March 2004. The inaugural match was held on 27th March against Akademisk Boldklub from the Gladsaxe Municipality which is north of Copenhagen, with the home side christening their stadium with an astounding 6-0 victory. Five of the goals were scored by Mohamed Zidan who used to play for AB, and thus for a while fans jokingly referred to the ground as the Zidan Arena after the goal scoring exploits of the Egyptian Striker. 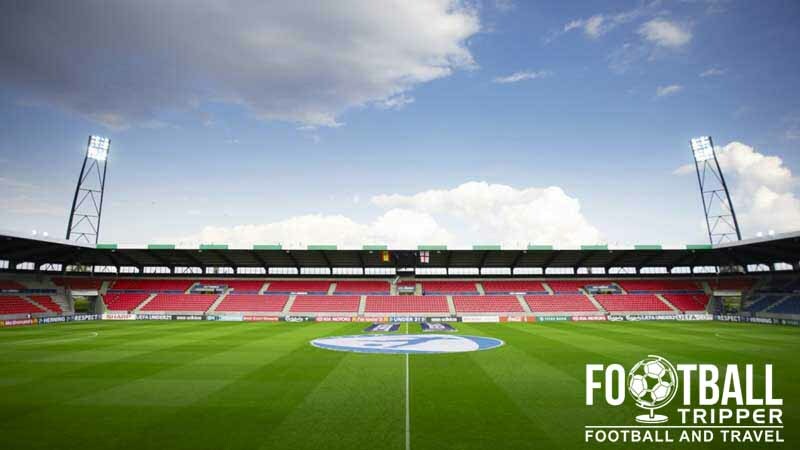 The current capacity of the MCH Arena is officially listed as 11,809 which includes an estimated 7,409 seats, with the record attendance set on the 11th November 2007 when 11,763 fans in a Superliga match against Danish giants, FC Copenhagen. 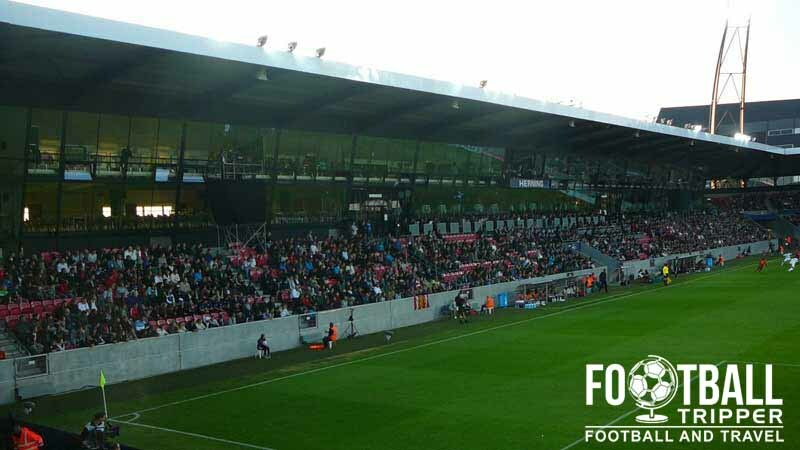 There are currently provisions for the stadium to be expanded to around 15,000 should the demand for tickets suddenly grow, but for now the ground is a good size for FC Midtjylland. Constructed to immediately satisfy UEFA’s Criteria for European matches as well as FIFA’s International standards, MCH Arena was made to host high-profile football games, although to date FC Midtjylland are yet to progress to the group stages of the Europa League after failing to get past the preliminary qualifying rounds. The ground has however hosted matches of the Under 21’s Euro 2011 tournament. MCH Arena is comprised of four stands: North, East, South and West. FC Midtylland are a Danish football team owned by Brentford Chairman Matthew Benham. Based in the “Central Jutland”, the club have also adopted a statistics based approach and were crowned Champions of the Danish Superliga in the 2014/2015 season which marked their first league title to date. Slowly developing a reputation for unearthing promising young talent, Midtylland are slowly reaping the rewards of setting up their own youth academy back in June 2004,. The first Danish club to do so, The Wolves biggest success stories to date are arguably the sale of Simon Kjaer to Palermo, and Winston Reid to West Ham. FC Midtjylland supporters are known as The Wolves or Ulvene in Danish. The club’s mos prominent supporters group were founded in 2007 as “Ultra Boys Midtjylland” but later renamed to the gender neutral “Ultras Midthylland”. Away fans are housed within the south-west corner of the stadium which is accessible from entrance/indgang 1. It is marked on the above seating plan as “Udehold” which literally translates as “away team”. For European matches don’t expect the away allocation to be particularly generous as FC Midtylland are currently having a purple patch. Based on UEFA’s 5% rule the away allocation is likely to be a fraction under 600 tickets but this is just a guess and by no means official. The majority of places to drink are to be found within the compact city centre as per the map below. FC Midtjylland operate a club shop at MCH Arena in addition to their own online store, known as the Wunderelf Shop. The club shop is also open for a few hours before kick-off on matchdays. Stadium tours of the MCH Arena are available to book during the week between 9.00 am – 5.00 pm. Costing 100 DKK per person, tours are generally available for groups larger than 8, however if you’re willing to cover the costs then you might be able to negotiate a private tour. You can book your place on the stadium tour by visiting this page. This is the view of the ground most fans will get as they walk from the Exhibition Station to MCH Arena. 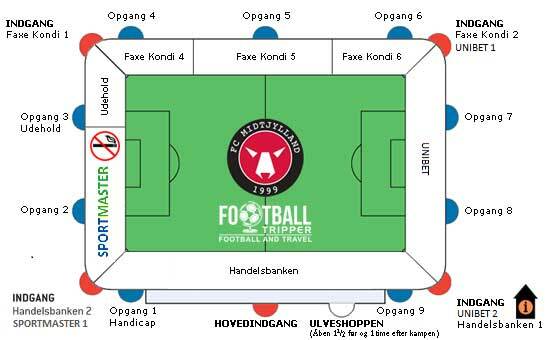 Tickets to see FC Midtjylland are predominantly sold online through the official website whereby you can select your seat, and then print out your ticket to scan at the turnstile. For more information or any questions you can send an email to [email protected] or phone the ticket office on 96,271,040. MCH Arena is located within Herning Exhibition Centre 3.7 km south of the city centre in an area which can only be described as “out of town” and “relatively rural”. Intrepid Wolves make their way to MCH Arena. A reminder that Denmark isn’t the warmest country in the world! There are two large car parks available for the use of football fans on match days. The smaller one to the south is accessible via Vardevej, and the larger one one to the east accessible from Messevej but don’t worry as they’ll both be signposted. Herning Station is 3.4 km north of MCH Arena which leaves the average football with a walk of around 40 minutes. The station reflects the relative size of the municipality with two platforms, and infrequent services to Copenhagen which take around three and a half hours. On matchdays you can catch a train service to the exhibition centre’s station which is known as “Herning Messecenter”. This will then leave you a more manageable walk of 10 – 15 minutes to MCH Arena. Billund Airport located 52km south is the nearest International Airport to Herning. Situated next to Legoland theme park, Billund is the largest Airport in Denmark and is served by a surprisingly large amount of European airlines. Karup Airport 12.5 km north east of Herning is technically the closest, but is only served by a handful of domestic and Scandinavian routes. The closest place to stay is undoubtedly Hotel Herning which sits on the edge of the Exhibition Park between Messecenter Station and MCH Arena. Naturally rooms sell out fast here which means the more expensive options in the city centre such as Hotel Corona, Best Western and Scandic Regina begin to look more feasible.